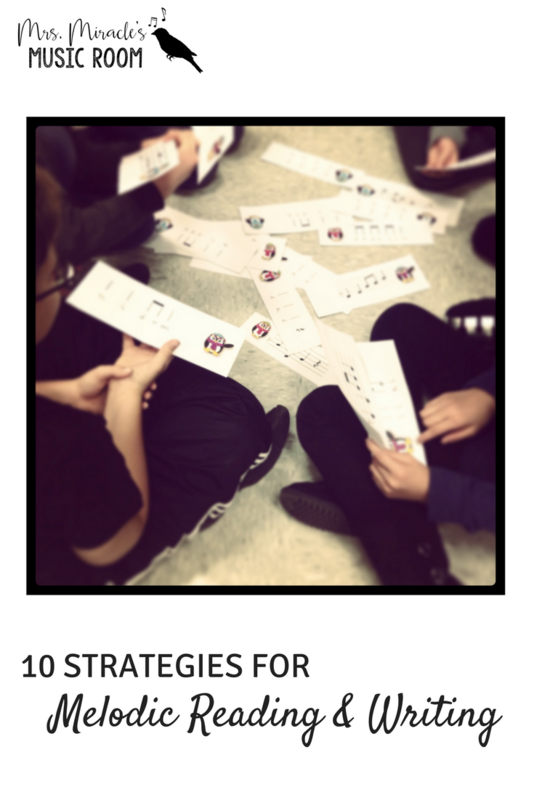 A few days ago, I wrote about 10 strategies for rhythmic reading and writing, in hopes of giving you ideas for your year plan. Today I will blog about 10 strategies for melodic reading and writing! As in the last blog post, some of the ideas I will describe in this blog post, some will link to other blog posts, and some will link to freebies and other products. Here goes! In this blog post, I wrote about how to do ghost melody composition on dry erase boards. This is a great precursor to having students listen for and begin writing specific pitches, like sol and mi. In this blog post, I wrote about how to introduce the staff to first graders. You could use chips (math counting chips work well because they are see-through, and students can see the line running through the note) or you could use cute seasonal erasers like I did in the blog post. Once students have worked as a whole group transferring stick notation to the staff, they can work in small groups to do the same. The above picture was taken while students were working with my Penguin Stick-to-Staff set for low sol; students had to work with the small group to match up the stick notation patterns with the corresonding staff notation patterns. It was so cool to hear their conversations about why cards matched or didn't match! Playing dulcimer can be a great way for students to transfer their knowledge of solfa to an instrument! You could put the staff notation or stick notation for "Hot Cross Buns," for example, on the board, show them where do is, and see if they can figure out how to play it on their dulcimers! My students are using cardboard dulcimers in this picture; you can purchase them here, and see my set below. Speaking of instrument playing, I love this game by Amy Abbott from Music a la Abbott! Students can play in teams, see the staff pattern, play it on their recorders, and try to collect points! The interactivity of the powerpoint is really cool--after they play the pattern, you can click X or O, and watch it appear on the tic-tac-toe grid. Anytime you can make a game out of building a skill is a great opportunity for improving their learning! Click the picture to see the product. Going through this process really seems to help break down the sight-reading into manageable steps and helps them be successful! In this blog post, I wrote about using solfa manipulatives with my students. I LOVE to use these as a precursor to writing or reading on the staff, and to really target their inner hearing. They also work really well as an assessment during whole group or centers! Having students use their hands as a staff is a very helpful way for them to kinesthetically understand lines and spaces on the staff. To use the hand staff, I have students look at the inside of their hands, and point to their pinkies for the first line, ring finger for the second line, etc. The first space can be between their pinky and ring finger. You could have them sing solfa while pointing to the correct spots on their hand staff. You could also do the hand staff incorrectly and see if they can figure out the mistakes! 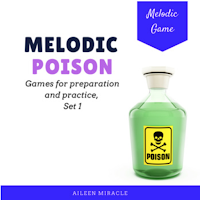 I just posted this fun set for playing melodic poison during preparation AND practice. Poison is one of my students' favorite games, and with this set you can project on your SMART board, white board, or print out the cards. Click on the picture to see the product. 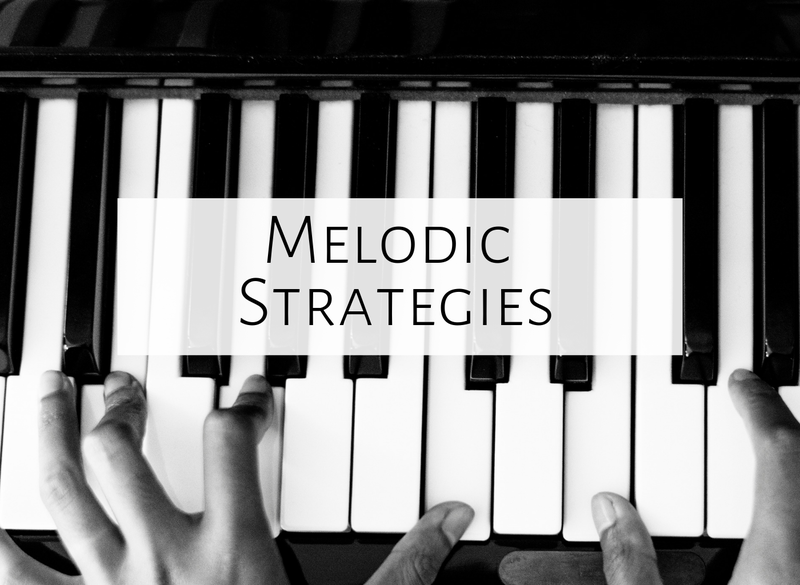 Which strategies do you like for melodic reading and writing? Comment below, and happy teaching! I love those dulcimers! What grades do you use them with? Thanks for sharing all these ideas!